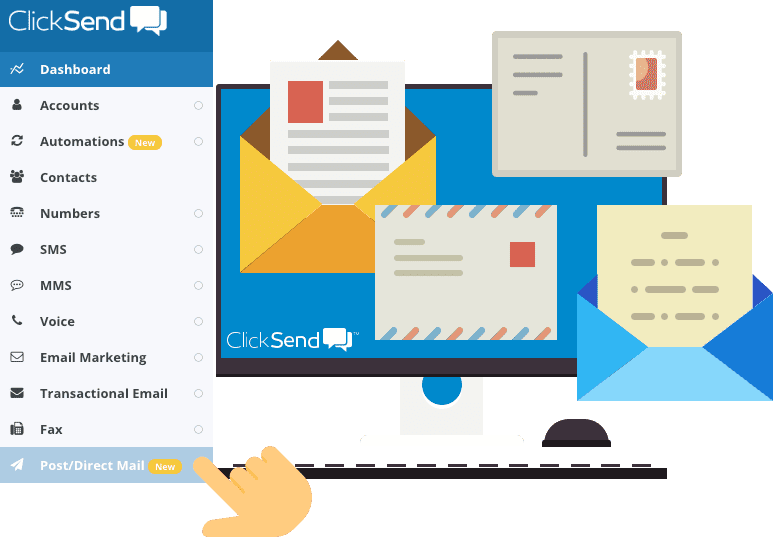 With ClickSend’s multi-channel platform you can not only send SMS, email, voice and fax within the one dashboard, but post and direct mail as well; letters, postcards, flyers etc. 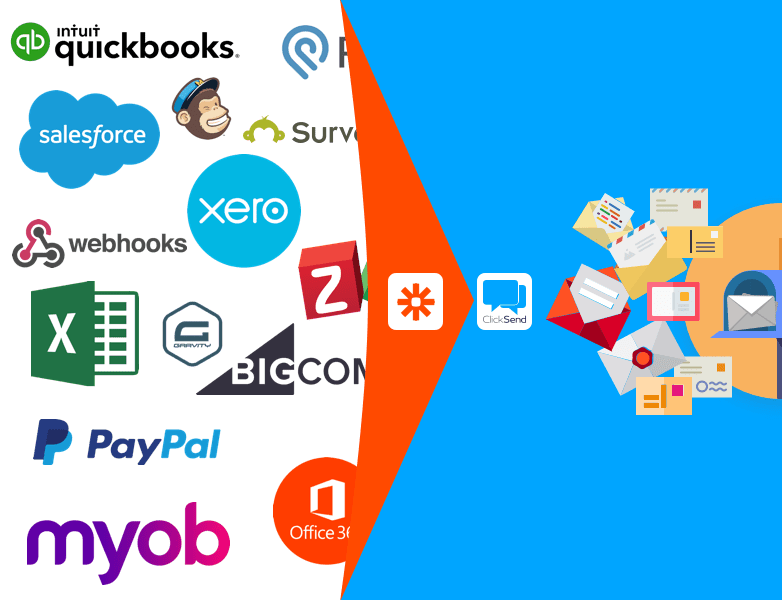 This can all be automated and scheduled within ClickSend BUT by introducing Zapier into the mix you can have your favourite web app software automatically send physical mail when certain actions happen. In this blog post we’ll run you through it. Sometimes there is a requirement for businesses to send physical mail to their staff and customers be it a letter, a post card, a receipt etc. Generally this will be a manual process after already using one, or more, pieces of software to capture or manage data of some description. 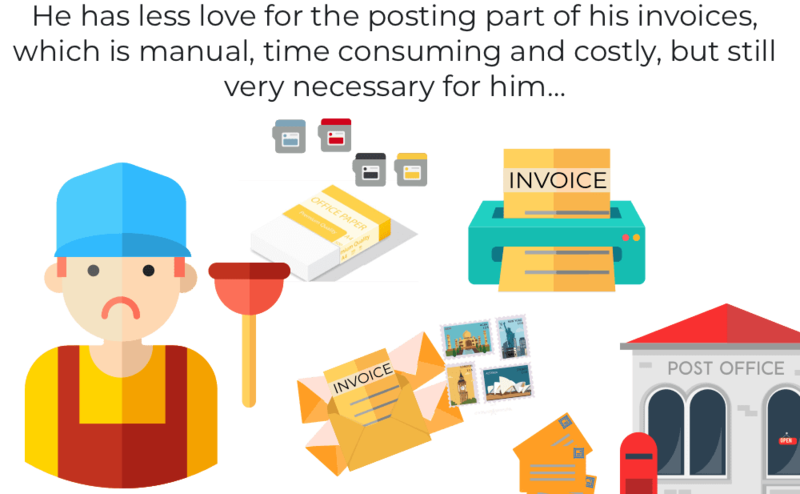 A very simple example would be John The Plumber who likes to also post a copy of his invoice along with emailing. 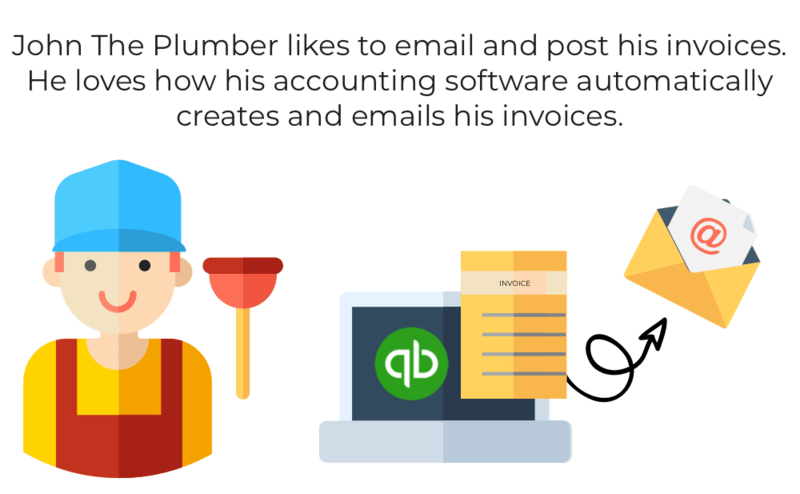 John uses an accounting web app like Quickbooks Online, which automatically generates and emails a PDF copy of his invoice. To post a hardcopy, John has to print off the PDF, stuff it in an envelope, stamp it and pop it in a mail box. John does this over 100 times a month….. The simplest explanation would be, it’s a piece of web based software (web app) that links other web apps together and gets them talking to each other (and by talking I mean doing things). Or as Zapier put it…. ClickSend are already a featured app on Zapier for our world famous SMS product (and the most popular under SMS #JustSaying) and we now integrate with 1,000 other products on their platform. You can read our blog on this amazing feat here. One of the most popular, and simple ways that businesses use ClickSend SMS and Zapier is integrating with Gmail. With this integration, every new email that hits your Gmail account you automatically get sent a text message via ClickSend so you can keep on top of everything. Ditch printing and folding and envelopes and stamps and post office queues forever! So now, like the ClickSend SMS + Zapier + Gmail example, but instead of an SMS, you could get a physical piece of mail automatically sent when a certain Gmail is received. You can create postcards or letters based on actions (or Triggers as called in Zapier) in your web apps. For example, you can automatically send a physical invoice when a specific type of email is received. Or send postcards when new data is created in your database. Zaps can even automatically send postcards based on new social media posts. 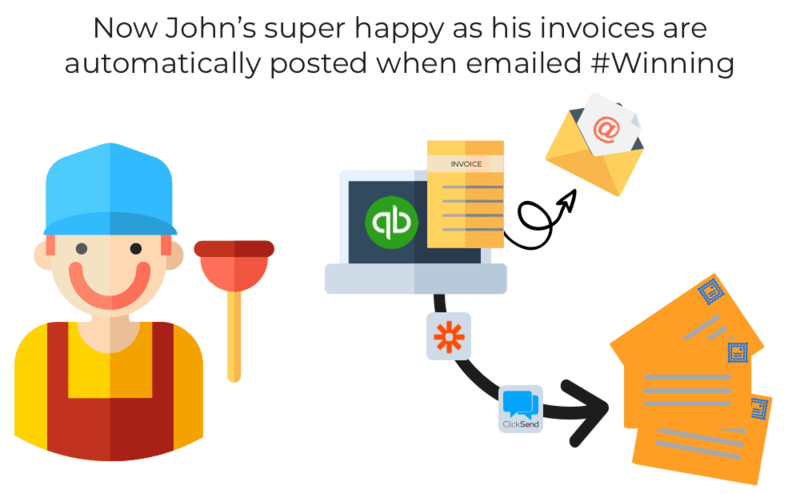 If we go back to our favourite tradesman, John, he’s super happy now because he’s set up a ‘Zap’ that Triggers a paper invoice to be automatically sent when he sends an electronic invoice through Quickbooks Online. The Zap that happens in the background makes sure the invoice is sent to ClickSend, who automatically print it, stuff it, stamp it and send it via their virtual print service. Too easy. And remember, ClickSend now integrates with over 1,000 apps so you can send mail on autopilot. Send Post Letter – Sends an A4 PDF document via the post. The PDF is printed, folded, inserted into an envelope and posted to any address globally. Send Postcard – Sends a postcard via the post. The PDF is printed and delivered to any address globally. Send MMS – Send a new MMS. Send SMS – Sends a new SMS. Create Contact – Creates a new contact in a list. Send Fax – Sends a new fax. Send SMS to Contact List – Sends a new SMS to a list of contacts. 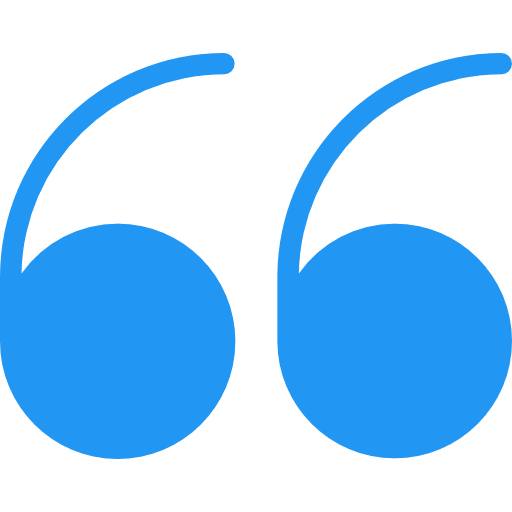 Create Contact List – Creates a new contact list. Send Voice – Send a Voice Text-to-speech message to a mobile phone or landline. Get your physical mail fully automated!